2/3 of students who cannot read proficiently by the end of 4th grade will end up in jail or on welfare. We are proud to feature Drew Engle as our Student-Athlete of the Week! Drew is a senior at Clearview High School in Lorain, Ohio, and is a member of the varsity football team. He has been involved with The 2nd & 7 Foundation for 2 years and began the reading program in his community by coordinating the efforts between the high school athletes and elementary school. As a scholar athlete, Drew has a 4.1 GPA and is a member of the National Honor Society. Drew has served as a class Vice President for 3 years, was voted Homecoming King and has also served as a Camp Invention volunteer and Mary Lee Tucker Clothe a Child volunteer. Currently, Drew is organizing a "Prom with Mom" at Clearview and is donating all proceeds to the Leukemia and Lymphoma Society in honor of his late uncle who recently passed away. 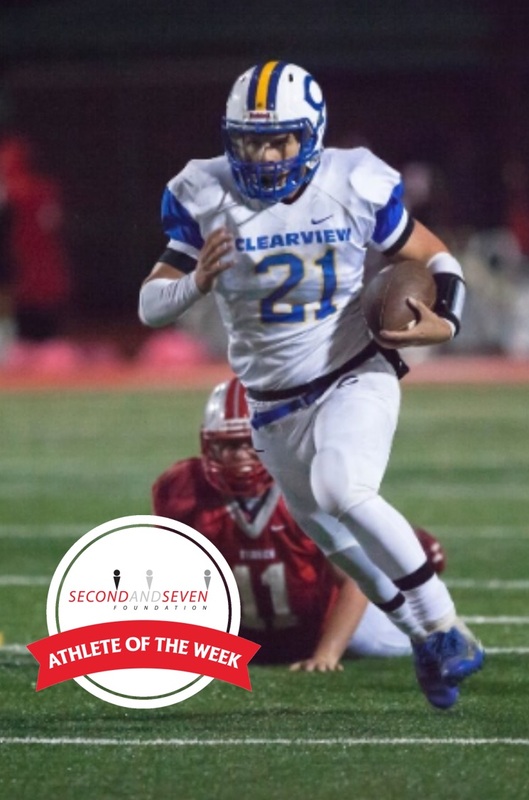 Drew has won many football awards, including: All-County, All-Conference, All-District, All-Ohio and is Clearview's all time leading rusher record holder. Drew's favorite part of 2nd & 7 is "seeing all of the younger students light up when they see us walking into the classroom. They get so involved in the reading and discussion. I always look forward to the next time I will come back. When I see them at games or other district events, there are so many that run over to say hi and give me a high five." Drew, we LOVE your enthusiasm and know that an amazing future will follow your days at Clearview High School!